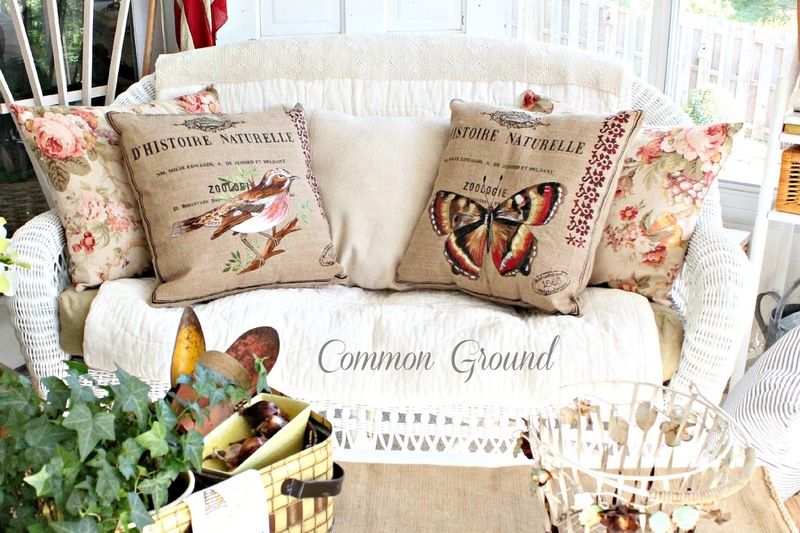 I know that I just showed you the updated (that would be "this week") sunporch, but I found some wonderful new pillows that I wanted to show you, and it just so happened they landed on the little wicker settee out there. I have a small obsession with birdies this time of year, and when I saw this embroidered birdie pillow at one of my favorite places I had to have it...and one to go with it. And can you see that they're burlap? This was one of my "ohmygosh, how stinkin' cute" moments. You know it's cute, when it's "stinkin' cute". As I predicted last week, we're heading right in to summer. Today is supposed to be in the upper 80's. where I nabbed these cuties. Robin always has wonderful inspiration. 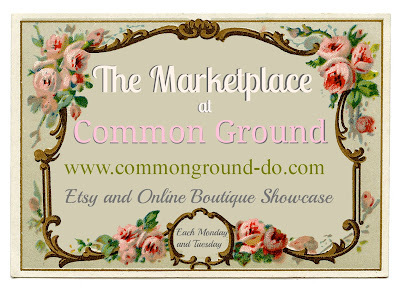 it's a fun way to shop Etsy for newly listed items. Runs each Monday and Tuesday. And they are perfect in your sunroom. Yes, those are stinkin cute and so is the cow candlestick. Your new pillows are "stinking cute" and yes, when I use that phrase it is top notch, paws down THE cutest!!! Well, sweet potatoes, I'm trying to soak all of your images in. So crazy beautiful...all of it. Love those pillows, Debra! I don't blame you for snatching them up! I can't believe that is embroidery. How beautiful. They look perfect on your sunporch, too. Love seeing new pictures of the Vintage Suitcase. I'm always looking for display ideas, so I appreciate them! I NEED everything in that store! 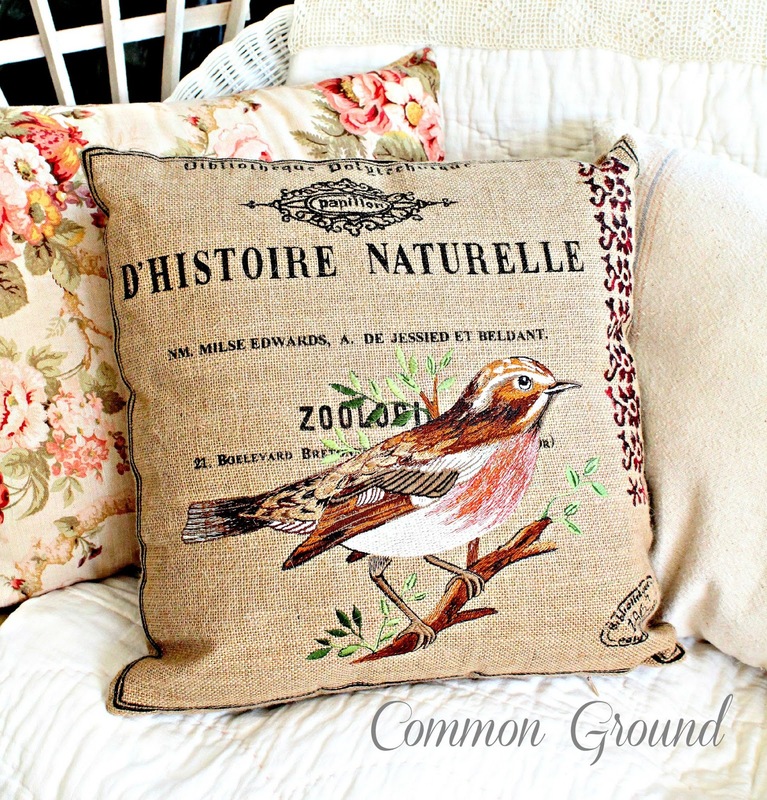 Your pillows are perfect - a charming addition to your lovely room. I love your stinking pillows. They look great on your wicker. 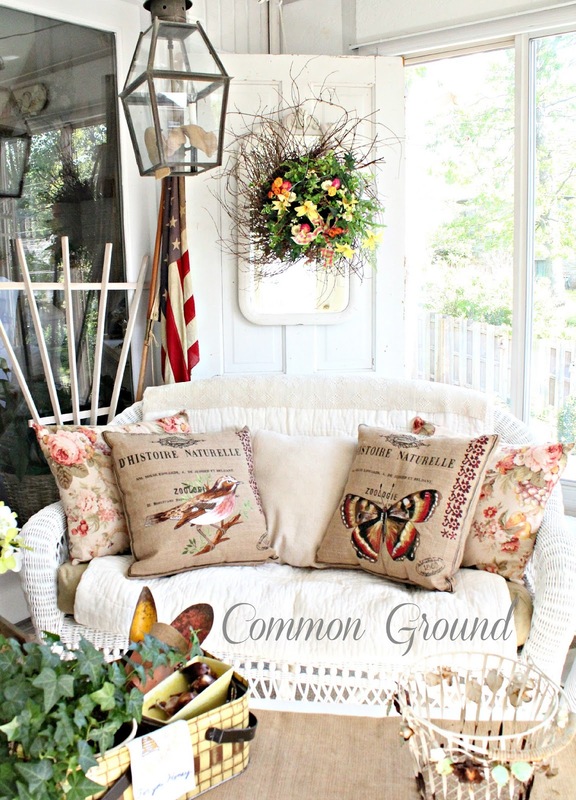 the sun porch is ready for Summer. Everything looks terrific. I would be in BIG trouble is I shopped at that store - thank god it's far away. You are right those pillows are stinking cute! They look beautiful in your sunroom. What beautiful pillows, and what a lovely sunroom! Looks so relaxing and beautiful! adorable pillows! I absolutely loved Robin's store when I was there in October. Can't wait to come back again for a visit! I loved everything about that space - so appealing to the eye. Your new pillows are lovely. I cannot believe you did not buy the cow! Oh yes...these are indeed stinkin cute Debra! These pillows ARE cute! And they look perfect on your settee. And I love your kitty in the window. I would seriously love to visit Robin's shop. I just wouldn't be able to hold back! lol! You are right, they are soooo stinkin' cute... really they are beautiful! LOVE the birdies too! 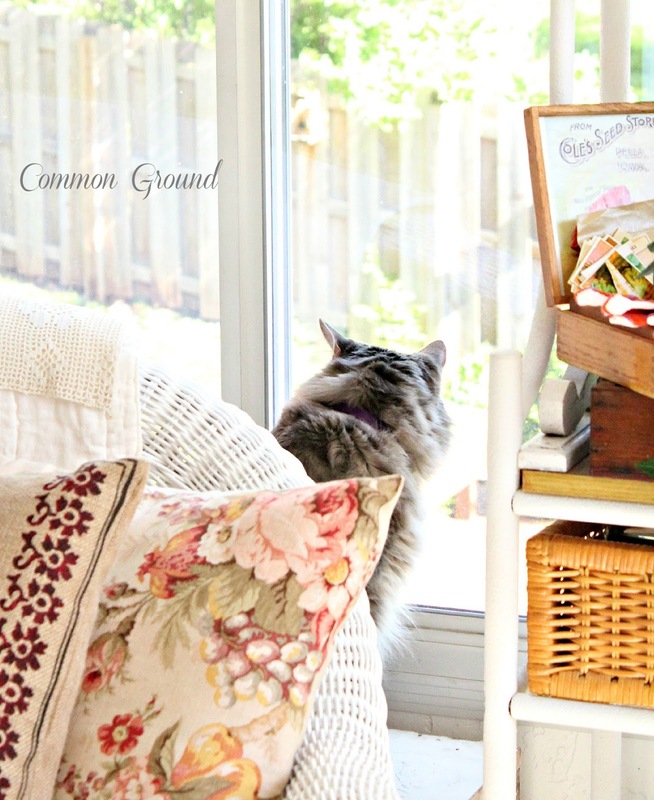 Your porch is delightful! Those are so stinkin cute. I love them and I always love seeing pictures of your sun room. I just bought a set of those cow candle sticks today. I love them. I found them at a shop near me. The are super cute. Super Great pillows! 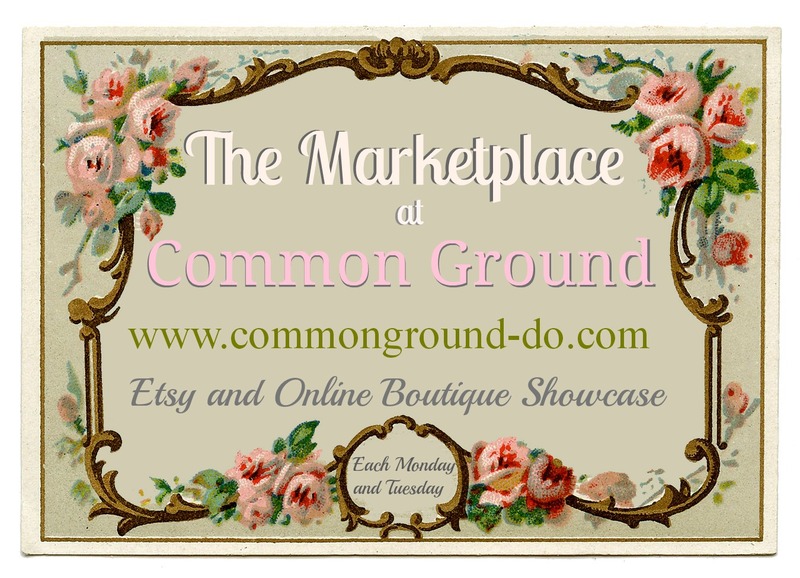 New blog and Pinterest follower. Have a nice day. Oh yes...those pillows are stinkin cute!! Love the embroidery on them! I agree, that shop is beautiful!!! I wish I could visit. Love those pillows. They are darling! Does she have an Etsy store too? Stinkin' cute? I should say so...to high heaven! And speaking of "high", I don't have a clue as to what you had to pay for 'em, but whether it was $ or $$$...so well worth it. I love them and you can call me Kermit I'm so green with envy. Is that another pillow with the airedale on it. Good grief, but she has some fab-o merch! Yes indeedie. They are stinkin' cute! 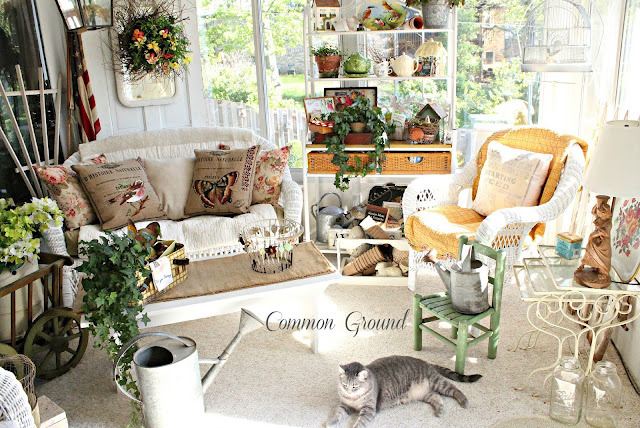 I LOVE your sun porch. Wish I was sitting there right now! Those pillows were made for you, they are beautiful! We are getting a taste of summer weather tomorrow!! Indeed, the pillows are stinkin' cute! And so is your cat! 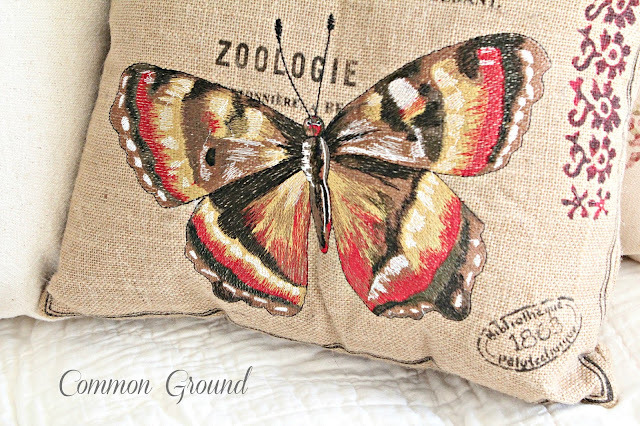 Love the bird and butterfly pillows...embroidered...wow! That pillow is stink'n cute. I would love that on a chair cushion! And that shop is to die for. Oh I wish I lived near there. So inspiring. Thanks for sharing this with us. Oh my gosh, those pillows ARE so stinkin cute indeed. I would of felt the same way if I ran into them, incredible. 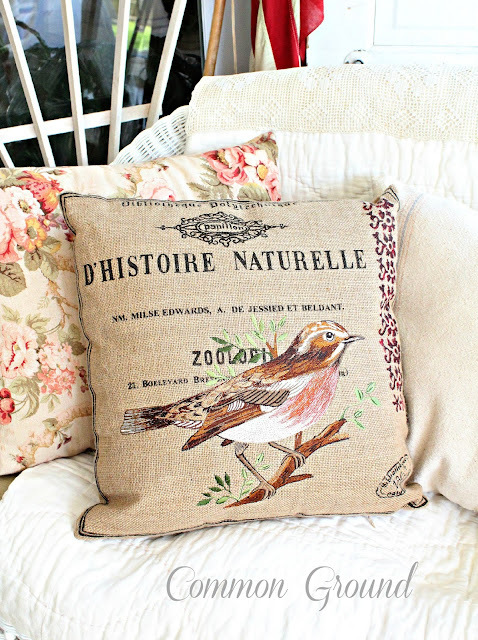 Love the pillows especially the one with the wren. They are starting to build their nests around here and we always end up with a nest in our little hutch on the breezeway. And that shop was amazing. I could get in to some trouble there. 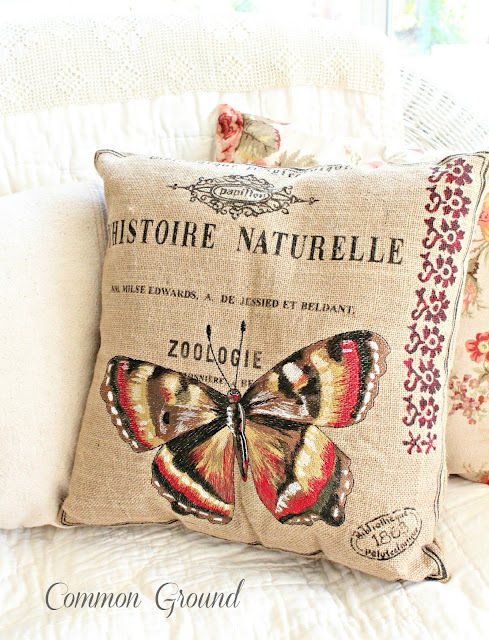 These pillows are spring-tastic! 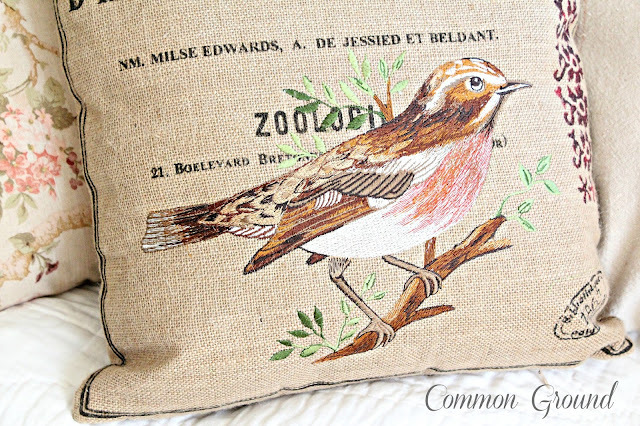 I love anything with sweet little birds on it! Thank you for sharing at the Scoop Link Party this week! Oh my gosh, how stinkin cute Debra! lol! I bet I'm the first (not) to say that. Really, they are so cute! Look great on the wicker. Thanks for sharing them with SYC. How cute are these pillows! I also love the rabbits. Great shop. Thank you for joining Home Sweet Home.